Beautiful Pintail. We have a lot here that come to visit for the winter. Lucky you to have a marsh to check out. A very handsome fellow indeed. That's a stunning capture. We get Pintail's here in the UK too but very rarely at such close range. First, your photo is, as Adam put it, stunning. Now, National Geo? That is awesome!!! Congrats! Oh, and I followed the link and rated your shot a 10. One of my favourite winter visitors over here. A very elegant duck, captured in all its glory. Great photo showing all the detail in this duck. Boom & Gary of The Vermilon River. I forgot to say I voted. But why isn't your Grizzlies feeding on salmon in there too? Your Art has been NG level for a long time and it's was inevitable the recognition would come. Congratulations! Your eyesight must be 20/10 because nobody focuses as sharply or delivers a more elegant composition than you. That's a great photo of a very handsome bird. o, this is on my wish list. A bird I´d like to see. It is soo elegant. @Small City Scenes: Thanks! That's great that you have these near you too -- they are so much fun to see, especially the drakes with their elegant lines. @Arija: This is a lovely tidal marsh that often has many different duck and shorebird species on it. Its actually right along a really well used trail for biking and running, so the birds are pretty used to having people around. @Adam: Thanks! This is really the only place where I've been able to get close to pintails. In any other location, there's no way I'll get within a few meters of them like I can here. @Early birder: I agree, they are by far the most elegant duck. I could just watch them for hours on end! @Gary: Thanks for your kind words and for voting in the contest! @Springman: Thank you so much for your complements, but again you are too kind! It's a real honor to have been selected just to be one of their favorites of that week of submissions. I'm so excited that I actually have an image somewhere on the NG site! Thanks for voting, I'll be sure to have a post if I manage to finish anywhere of note. @theconstantwalker: Thanks -- they are a beautiful species for sure! @Naturefootstep: I hope you have a chance to see one soon, they really are a pleasure! @Dominic: Thank you for your very kind words! @Øyvind: Thanks so much for your comment, and for voting! 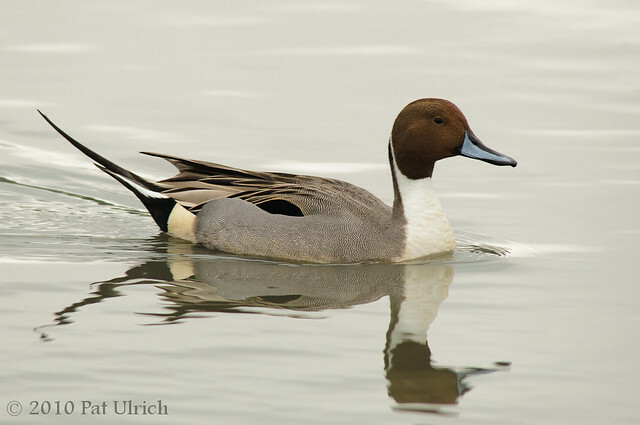 Great shot of the Northern Pintail Pat. They are such handsome drakes. Congrats on the NatGeo photo too! I went and voted for it even though I guess it's too late for the contest. Good luck! Great photo of the Drake. Fabulous capture of the Drake. The light was perfect. Dang...it is too late for me to vote. Hope you win! @Larry: Thanks -- I agree they the drakes are so handsome, they really have the most beautiful shape and lines of any duck species. And thanks for voting for my NG image as well. I'm not sure when the actual voting has ended, but the page is still live and they haven't announced the Viewer's Choice winners yet. @dreamfalcon: Thanks! I got a lot of shots with choppy water, and was glad to see that this frame came out with a smooth surface. @Jean: Thanks! Heavily overcast lighting can be ugly in many situations, but on the plus side the scene is nicely evenly lit. I know many people shy away from gray days, but I enjoy them.